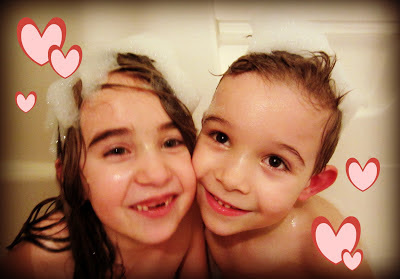 Last night the kids and I went to Target for a couple groceries and their first Valentine's present: bubble bath from the dollar bins. I didn't realize it until recently, but we tried bubble bath when they were littler and they freaked out. Wouldn't even get in. We've never done it since. So when they asked what a bubble bath was, I thought we needed to give it another go. Anticipating their Friday night bath, I let them pick some out. So tonight was the big debut and it was a hit. Daddy was presented with peeps, which is his first installment of Valentines fun. He loves them. The kids and I think it's sneaky to get them for him for every holiday and he continues to act surprised. Either he's very sweet (we know that already) or he's figured out that the act keeps the treats coming. I'm thrilled about the balance in our fun money because this weekend's forecast is expensive but fun. Hopefully we can live it up and still squeak by money-wise! Ha ha, love kids asking what basic things like bubble baths are :) Brylee LOVES them but Ian drinks the soap :/ There are plenty of other things that I don't even think of her not knowing about.